Aubree Hawley accepts the Three Minute Thesis winner award from Kim Needy, dean of the Graduate School and International Education. 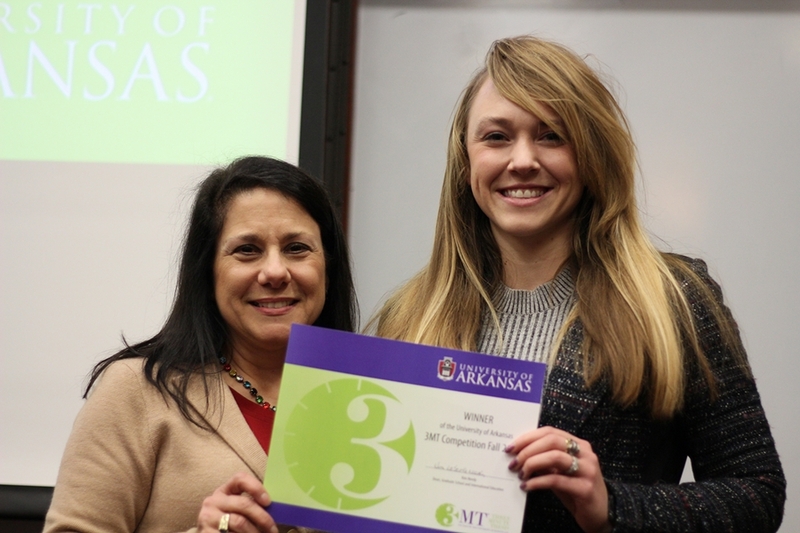 Aubree Hawley is the winner of the University of Arkansas Three Minute Thesis competition. She earned the top prize for her presentation Age, Not Protein Source, Influences Energy Metabolism and Appetite in Response to Breakfast. As the top finisher, Hawley won $750 and entry to the Conference of Southern Graduate Schools' regional Three Minute Thesis contest. Hawley is a food science doctoral student and is advised by Jamie Baum. In the regional contest Hawley will compete against roughly 50 students from universities across the Southern Region. The contest will be held Feb. 16 in Knoxville, Tennessee. Members of the audience voted for Rinalda Proko as the People's Choice winner. She won $500 for her presentation Stopping a Cereal Killer. Proko is a cell and molecular biology doctoral student and is advised by Martin Egan. Hawley and Proko were two of six students who earned a spot in the University of Arkansas final. Each student had previously won a competition held in the academic college that houses their degree program.